Nothing you see here is real, even though the conversion or the presented background story might be based on historical facts. BEWARE! The North American F-86D Sabre (sometimes called the "Sabre Dog") was a transonic jet all-weather interceptor conceived for the United States Air Force, but found use in many other air forces, too. Originally designated YF-95, work began in March 1949 and the first, unarmed prototype made its m,aiden flight on 22 December 1949. It was the first U.S. Air Force night fighter design with only a single crewman and a single engine, a J47-GE-17 with afterburner rated at 5,425 lbf (24.1 kN) static thrust. Gun armament was completely eliminated in favor of a retractable under-fuselage tray carrying 24 unguided Mk. 4 HVAR rockets, then considered a more effective weapon against incoming enemy bomber groups at high altitude than a barrage of short-ranged cannon fire. The YF-95 nomenclature was short-lived, though, as the design was subsequently re-designated YF-86D – even though the new aircraft had only a 25% commonality with the F-86 day fighter. The fuselage was wider than the daytime fighter and the airframe length increased to 40 ft 4 in (12.29 m), with a clamshell canopy, enlarged tail surfaces and an AN/APG-36 all-weather radar fitted in a radome in the nose, above the relocated air intake. Later models of the F-86D received an uprated J-47-GE-33 engine rated at 5,550 lbf (24.7 kN) (from the F-86D-45 production blocks onward), and a total of 2,504 D-models were built until 1954. Derivatives for NATO partners (models K and L) eventually returned to the cannon armament, had a simpler avionics suite with an MG-4 fire control system, an APG-37 radar and augmented these with IR-guided AIM-9 Sidewinder AAMs. Among the many overseas operators of the Sabre all-weather fighter in Europe and Asia, Finland's Air Force settled upon the type as an addition to the newly adopted MiG-21F-13 of Soviet origin as the Ilmavoimat’s primary high performance daytime interceptor in the early Sixties. During the Cold War years, Finland tried to balance its purchases between east, west and domestic producers, strictly limited by the Paris peace talks of 1947. This led to a diverse inventory of Soviet, British, Swedish, French and Finnish aircraft. After a thorough selection process, the Western F-86K was chosen and a total of 22 machines was procured from Italy, where most of the machines for European NATO partners were built in license. The Ilmavoimat’s F-86Ks featured the F-86D’s “short” wing from early production, and were originally delivered in bare metal livery, even though this was soon changed and a protective camouflage paint scheme applied. 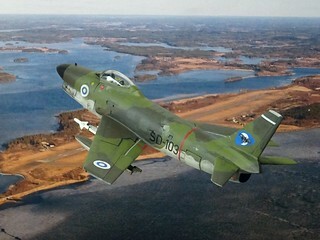 By design, the Finnish F-86Ks were able to carry IR-guided AIM-9B Sidewinder AAMs on underwing pylons – but the Finnish Air Force did not procure the Sidewinder at all. Effectively, the Finnish F-86Ks were armed with K-13 AAMs, procured together with the MiG-21Fs and integral part of the fighter as a weapon system. Similar in appearance and function to the American AIM-9 Sidewinder, the K-13 was reverse-engineered from early Sidewinders, obtained by the Soviet Union during the Second Taiwan Strait Crisis in 1958 via China. The copy work was actually so thorough that shape and size of the missiles were almost identical. Western shackles could be used without a problem – and the copy work even went so far that the K-13’s internal elements like the guidance system were so closely modeled after the AIM-9B that Western and Eastern electronics were actually easily compatible! The unusual result was that the Finnish F-86Ks were the only Western fighters at that time toting weapons of Eastern Block origin! The Finnish F-86Ks were assigned to two fighter units (HävLLv 21 and 31, located at Rovaniemi and Kuopio-Rissala, respectively), where flights for daytime (equipped with MiG-21Fs) and all-weather interception duties were built up and operated side-by-side. Maintaining both the MiG-21 and the F-86 at the same time and the same places turned out to be a logistic nightmare, especially for a relatively small air force with limited resources like the Suomen Ilmavoimat. Consequently, the Sabre interceptors were already retired after a mere 10 years of service in 1972 – but the type was totally outdated, anyway, and posed no serious deterrence to potential intruders. In the all-weather interceptor role, the F-86Ks were replaced by the Swedish state-of-the-art Saab 35BS Draken, while the MiG-21Fs soldiered on until the Eighties and were augmented and replaced by the MiG-21bis, which were also all-weather-capable. Another entry for the “Old Kit” Group Build at whatifmodelers.com in late 2016. Inspiration for this one actually came from a flight simulator screenshot, posted in the WWW: someone had mated an F-86 daylight fighter with a skin from/for a camouflaged Finnish MiG-21MF – and the classic, green camouflage scheme with the roundels under the cockpit looked interesting, to say the least. Anyway, I could not find a good historical slot or justification for the daytime Sabre in Finnish service, because this role was filled out through the much more capable MiG-21F. A contemporary all-weather fighter was lacking, though, and so I realized the concept through a Sabre Dog, for which I dug out an 1:72 Airfix F-86D from 1975 from the kit pile. Adding holes and fairings for the four guns on the air intake flanks was the easiest part (including hollow steel needles as gun muzzles). More complicated was the addition of two fuselage plugs: the F-86K had a slightly longer fuselage than the original D variant, for CG reasons. That difference was just 20cm (8 inches) in real life, which means a mere 3mm in 1:72 scale, added behind the wings. It’s minimal, yes, but I decided to add this extra length and chose a very simple method: once the fuselage had been finished/closed, I made a Z-shaped vertical/horizontal cut above and behind the wings and added two “bulkhead plugs” of oversized styrene sheet (actually a 2× 1.5mm sandwich) between them. Simple, but effective, and once the fuselage had been put back together again, the sheet be easily trimmed and hidden under relatively little PSR work, since the old Airfix kit comes with raised, relatively delicate surface details. Integrating the air intake turned out to be a little tricky: Basically the intake duct fits well into the fuselage opening, but the many styrene layers look very thick and massive, so I tried to take away as much material as possible. The intake lip still looks rather round, though, and the tight space does not make thing easy. The “short” OOB wings of the F-86D were kept; I could have exchanged them for “6-3” wings from an F-86F-40, but early production F-86Ks still had the short D variant wings. While working on the fuselage, though, I decided to modify the canopy for an open position. OOB, the kit just features a single clear piece; the canopy frame is an integral part of the fuselage, so a closed cockpit is the only option. The latter was cut out and some interior details added; the canopy was cut into two pieces. Inside, a new seat replaces the rather simple OOB part, and I added side consoles that fill the otherwise rather empty cockpit. Other additions are the inner pylons (from an Academy MiG-23) and the pair of launch rails and K-13 AAMs, taken from a MasterCraft Soviet aircraft weapon set. I also used different (757 l) drop tanks – taken from a Revell G.91. I guess these are actually F-86 drop tanks, but they are slightly bigger than the Airfix OOB parts, have simply a better shape and the fins are more complex, including small end plates. Around the hull, some air scoops, antennae as well as a pitot on the bow side wing were added. As mentioned above, this build was inspired by a CG simulation. The scheme on my Sabre Dog interpretation of the topic was inspired by a Finnish MiG-21U trainer, but, effectively, the pattern is based on an early Finnish Bae Hawk 51 trainer: a vivid olive green and “another murky color”, combined with pale grey undersides and a rather wavy waterline and the grey partly extended upwards on the flanks. There is much debate concerning the colors to use. While FS 34096 is IMHO a good option for the lighter green (at least for WWII aircraft, even though there seem to be wide variations, too), too, the “murky color” remains obscure – the recommendations range from pure black though dark olive drab or Forest Green (FS 34079) to a chocolate brown. Obviously, light and weathering have a huge impact and the paints and how they appear. According to a trustful source (fellow modeler Snowtrooper at whatifmodelers.com), here's some additional information: "The "light" green is the (in)famous Kimmo Kenttävihreä (Kim the Field Green) which according to the official standard is roughly FS 34151 or BS381c 222 aka US Interior Green (or British Light Bronze Green) which is just about nonstandard as hues get, and as it gets weathered (which it does very quickly) it gets a more yellowish hue. The official name is very descriptively "Vihreä" (green). The "dark" green, supposedly about FS34064/BS381c 437 can be approximated with just about anything ranging from Schwartzgrün to Helo Drab - a very dark green that weathers to a brownish hue and gets progressively lighter. The official name calls it "Mustavihreä" (black green). The light gray (Vaaleanharmaa) is variously approximated either as FS36440 or RAF Aircraft Grey BS381c 627. A complicate subject, and I relied upon pictures of real world aircraft for guesstimates, and tried to avoid FS tones for a more individual look. As basic upper colors I settled upon simple Light Olive Green (Humbrol 86) and a 1:1:1 mix of Humbrol 173 (Scenic Track Color), 242 (RLM71, Dunkelgrün, a pretty murky and bluish variant, though) and 108 (WWI Green, a very dark olive tone) for an “Extra Dark Braunviolett”, or - how I’d affectionately call it - “Breen”. Simple RAF Aircraft Grey (Humbrol 166) was used for the undersides. Before the basic enamels were applied, some acrylic Aluminum was also added as a primer under the leading edges and the rear fuselage where the afterburner is located: some chipping is to simulate some wear and tear after almost 10 years of service under harsh climatic conditions. For the same reason I painted some areas in slightly different colors, simulating repairs and replacement parts. The upper colors were, after a light black ink wash, thoroughly lightened through dry-brushed panel shading with Humbrol 226, 150, 159 and 80 (for a deep, grass green look) as well as 173, 10 and some 251 (in order to preserve the rather brownish hue of the dark tone). Interior surfaces remained authentic: a grey (Humbrol 140) cockpit interior, interior green (Humbrol 226) landing gear wells, and landing gear struts and covers in dull Aluminum (Humbrol 56). The air intake duct became bright Aluminum (Revell Acrylics 99). Roundels and squadron markings come from an Italeri 1:72 Bf 109G kit; the “Bat & Moon” emblem belonged to 2./HävLLv 31 when it was a night fighter squadron in the early Fifties, but it disappeared with the Finnish Bf 109s. The fictional all-weather F-86K appeared like an appropriate carrier, and, otherwise, the well-known lynx emblem would have been the alternative. The individual tactical code was puzzled together from single black letters and digits (TL Modellbau), while most stencils come from the OOB sheet and some other sources. “SD” was chosen (“Sabre Dog”, maybe? ;-)) since “SB” had already been used in WWII and other letter combinations carried some unwanted political connotations. After all, it’s a whif, and the Finnish tactical code system is very flexible, if not creative. A model with more work involved than visible at first glance. One can argue whether the addition of the two fuselage plugs was actually worthwhile?